​​Puppy Vantage formula offers optimal holistic nutrition, which fulfills the special needs of growing puppies. It contains DHA, a type of long-chain Omega-3 Fatty Acid that is present in concentrations in brain and retinal tissue and aids in healthy brain and eye development and function in puppies. Puppies are always on the go and they need energy for growth and play. Earthborn Holistic uses wholesome, nutrient-rich carbohydrates such as sweet potatoes, brown rice, oatmeal, and barley, because they are easy on your puppy’s digestive system and important for his overall good health. Real chicken meal and whitefish meal are high-quality protein sources that support the development of strong, lean muscles and provide necessary energy for growing puppies. Balanced Omega-6 and Omega-3 Fatty Acids play a vital role in establishing the lipid barrier of the skin, supporting your puppy’s healthy skin and coat. Proper levels of calcium and phosphorous help ensure the right mineral balance for building strong teeth and bones. Made with high-quality ingredients and processing technology, Puppy Vantage provides excellent digestibility and nutrient absorption. Earthborn Holistic Puppy Vantage may be fed to puppies from the age of four to six weeks through to 12 months. For the first six months Puppy Vantage should be available to your puppy at all times. After six months, using the chart as a guide, divide the recommended daily portion into two meals per day. The recommended feeding portion may vary according to age, breed and temperament. If unsure, consult your veterinarian. Have fresh water available at all times. No need to supplement. 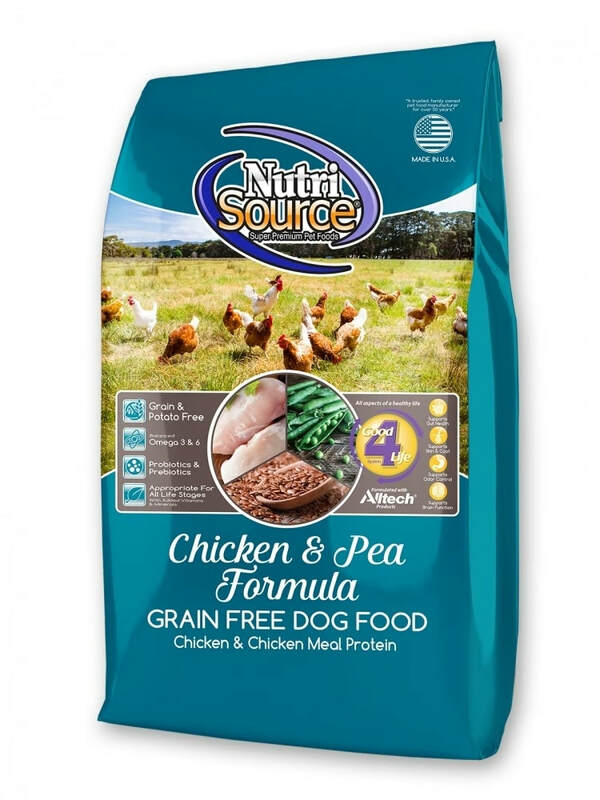 ​NutriSource Chicken & Pea Formula Grain Free provides super premium nutrition in a scientifically formulated easy to digest food. Real Chicken is the #1 ingredient that features excellent palatability, digestibility, and tastes dogs love. Chicken is a source of high quality proteins to help maintain your dogs muscle mass and strength. Chicken Formula Grain Free features the NutriSource exclusive "Good 4 Life" system and is made with the finest quality ingredients available. NutriSource Chicken Formula Grain Fee combines Chicken and carefully selected ingredients in the precise blend to balance all essential nutrients necessary for optimum health, well being and long life. Readily available nutrients in Chicken go to work on the inside, resulting in less waste.